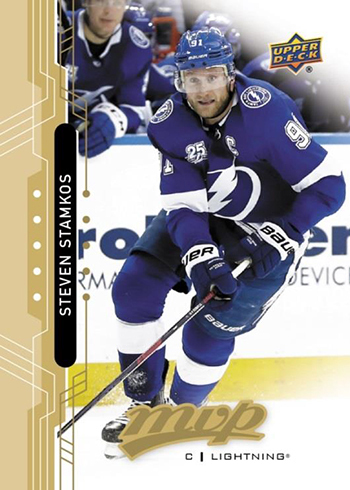 2018-19 Upper Deck MVP Hockey marks two decades since the brand made its first appearance for the sport. In some regards, the MVP brand may not be one that carries a lot of punch. But it has still been a venerable entry-level set over the years. And just has been the case for a long time, accessibility and affordability are keys to the product. It also happens to kick off Upper Deck’s 2018-19 hockey card season. 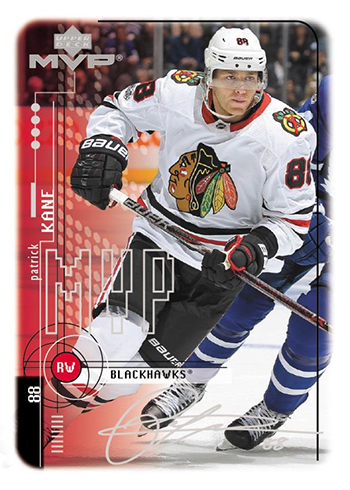 The main 2018-19 Upper Deck MVP Hockey base set clocks in at 250 cards. Among them are high number short prints. While rarer than the rest of the checklist, at every other pack and the moderately low price point, finishing the full checklist shouldn’t be too much of a challenge. Parallels come in several levels starting with Silver Script, Super Script (/25) and Black Super Script (/5). Over the past couple of years, retail has had some exclusive Scripts parallels as well. These cards, which come with facsimile signatures and not real ones, have been part of MVP from the beginning. Puzzle Back parallels return. As the name suggests, these have puzzle pieces on the back that, when combined, form a larger player image. 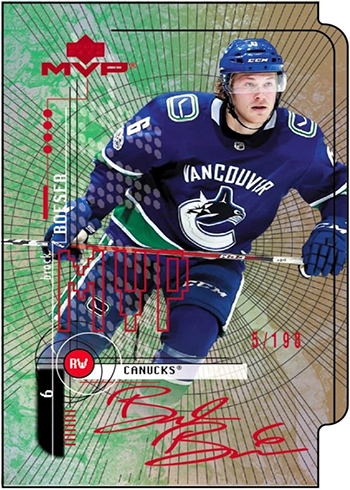 2018-19 Upper Deck MVP Hockey hobby boxes have five or six of these parallels. 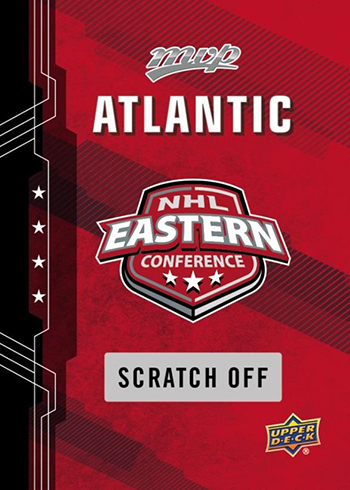 Because the set comes out before the start of the season, Rookie Cards on the main checklist are carryovers from players who made their debut late in the 2017-18 season. However, four Rookie Redemption cards are available that will provide cards of 2018-19 rookies later in the year. Each division has one of the rare cards. 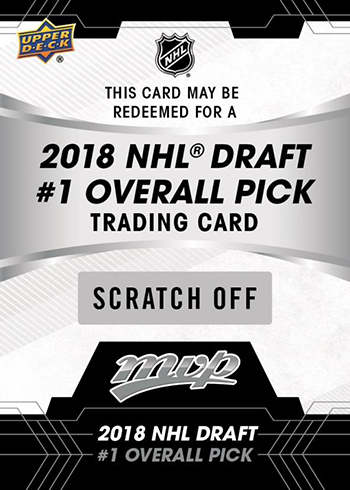 There’s also a separate redemption card for a card of the first pick in the 2018 NHL Draft. 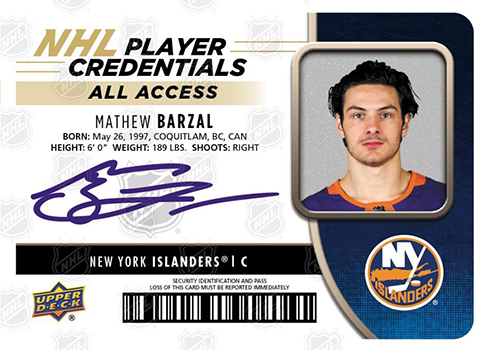 The redeemed version of the card will be released after they make their NHL debut. 2018-19 Upper Deck MVP Hockey has a couple of nods to the set that started it all two decades earlier. For starters, there’s the 20th Anniversary Silver Script Tribute. These put current players on the 1998-99 Upper Deck MVP Hockey design. They land approximately 1:5 hobby packs. Tribute cards come with Colors and Contours parallels. Done on Spectrum Light FX stock, they also come die-cut. Colors and Contours Gold cards are numbered to 198 while Purple versions have eight copies each. 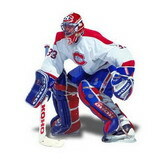 Also in packs are 1998-99 Upper Deck MVP buybacks, original cards that have since been stamped and are numbered to 20. 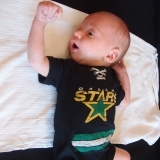 NHL Player Credentials return for a second year. Designed to resemble an ID card. They checklist takes a tiered approach with three main versions: Entry Level, Level 1 and VIP. Autograph versions are hard to find but not impossible. At least one signature is in every hobby case. Paráda MVP 98-99 jsou jedny z nejoblíbenějších karet, perfektní retro! Na tyhle karty se ohromně těším. Minimálně jeden box bude "povinností". Krásný karty, včetně retra. to vis ze ti vyjde..dyt EDM mel sezonu na hojno ale NUGE mel slusnou...connoir je jasnej a Nuge byl lepsi nez Drais..tak "MUSI"..
a tyhle MVP fakt naadhera..ty budou jedny z nej opravdu za tech 20 let..uz se tesim na checklist koho tim "pocti"
Panečku, tak tohle vypadá hodně povedeně, už řadovky se mi moc líbí, pak C&C taky super, no a k výročním kartám se netřeba vyjadřovat! Cena by snad měla být taky příznivá, tak tenhle boxík si určitě loupnu. Ten nápad s MVP 98-99 je super... Už se na ně moc těším..
MVP jsou super každý rok. Bohatý checklist (poslední roky nevídaný jev a proto má obliba tohoto produktu ještě vzrostla), design karet mi také sedí. Tenhle ročník se povedl dvojnásobně. Řadovky super, retra ještě lepší. A ten checklist - Dvojnásobná radost. Především u toho retra - Špaček, Prospal, Eliáš, Reichel, Svejkovský, atd. a Maaartin Straka. Na tohle se vážně těším. Dawe4 píše: A ten checklist - Dvojnásobná radost. Především u toho retra - Špaček, Prospal, Eliáš, Reichel, Svejkovský, atd. a Maaartin Straka. Zase to bude o to zajimavejsi ze i v mvp boxu se da neco co tu cenu ma najit. Ja urcite jeden box zkusim, hned jak bude na shopu. Co jsem videl rozbalovacky tak jsou to fakt krasne karty.